Superbowl LIII was not as exciting as we hoped it would be this year. The game did not deliver major upsets and large scores, which is the stuff all Superbowls are made of. Yet, we saw little to nothing of it. Yes, the match made history, as the lowest scoring game of all time, which is really not the kind of history we are looking forward to at such a big stage. However, looking at it from a different perspective may reveal that both teams were formidable competitors and therefore it was not easy to overcome and stifle the other. What we do know is New England Patriots fans will love the match regardless. 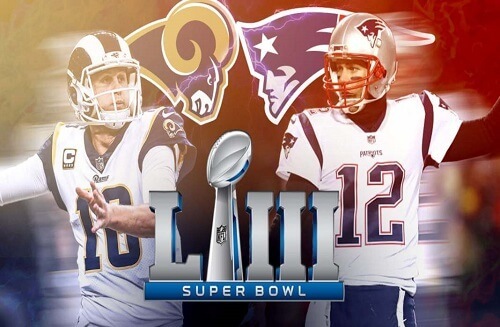 Let’s dive into what the highlights of Superbowl LIII were. New England Patriots victory over the Los Angeles Rams made positive history for Patriots quarterback Tom Brady. He became the most successful player in the NFL a record he previously shared with Charles Haley. This recent win has earned Brady his sixth ring. Not only was the quarterback celebrating, the coach of the victors broke a record himself. Bill Belichick at age 66 has become the oldest coach to lead a winning side to Superbowl final victory. Apart from the game a great highlight was the performance of the national anthem. Gladys Knight’s soulful rendition of The Star-Spangled Banner was powerfully moving. The response to Maroon 5, Travis Scott and Big Boi’s performances at halftime was lukewarm on social media. However, at the Mercedes Benz Stadium in Atlanta match-goers were seemingly entertained. As we mentioned earlier the game was the lowest scoring total in the history of Superbowls. Los Angeles Rams scored only three points against New England Patriots thirteen. As much as that may have been boring for some, likely gamblers who wagered online across various betting sites may have enjoyed rewards. One example is a US gambler in Nevada who managed to win US$100, 000 from a US$250 bet for predicting the Rams flimsy score. We only hope that Superbowl LIV will hold more in terms of exciting gameplay. Who is your money on to win next year’s Superbowl 54 edition? While we wait, readers who enjoy gambling online can enjoy a quick game of slots or other casino games online at the best USA casinos online that we recommend.